If there's one thing I find more annoying than American films that try too hard to be cool, it's British films that try to hard to be cool. Why? Because American films that try too hard to be cool are almost always cynical ploys by marketing executives to "get with the times," even though they are clearly aware that they are not in any way, shape or form "with the times," and so tend to produce Poochies that range from lazy to kind of embarrassing to masterpieces of unintentional comedy. British movies that try too hard to be cool, by contrast, range from grating to grating. 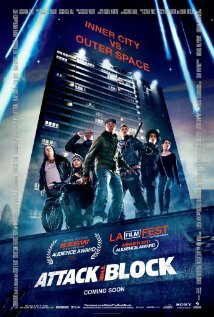 Thus I should probably not have been surprised to find that Attack the Block, a film about how a group of inner city London youth and the woman they just mugged fight off an invasion by alien hellhounds, would both try too hard to be cool and, consequently, irritate the living hell out of me. The idea is interesting, but that's about the only good thing I can say about this film, because most of its excruciating 88 minutes are made up of cliches, failed attempts to be quotable and more cliches. It's as if the film's writers, producers and directors are saying: "hey friend! Look how badass these kids are. You can tell because they smoke weed. Weed! And did I mention that they mug women walking alone late at night? Yeeeeaaaaaaaah! Badass!" I spent most of the film hoping that the hellhounds--or something--would eat them, then turn on the film itself and erase it from living memory. So yeah...don't see this one unless you think introducing rapping kung-fu hippie surfer dogs into a well-established mouse/cat scenario is a good idea. Bonuses: +1 for I saw it on a plane; +1 for at least it's not as bad as Human Traffic. Penalties: -1 for that's all I could come up with; -1 for plus there's the incredibly irritating cast of characters; -1 for especially that one kid. Cult Film Coefficient: 2/10. "Really really bad."